On plantations, slaves cobbled together a powerful system of magic, learning to gain luck, manipulate minds and even to kill using common objects. On lonely country crossroads, desperate people made bargains with the Devil for wealth, talent and power. On the shores of Louisiana Bayous, under overhangs of spanish moss, free Blacks met to practice an ancient and secret religion, calling powerful beings into their bodies. In isolated cabins and shacks, bitter outcasts waited until night and traveled forth in another form to prey on the communities that had rejected them. Under “hanging-trees,” in graveyards and on old battlefields, the spirits of those who had been murdered returned to terrorize the living. Deep in ancient mountain-side forests, ancient and terrible beasts stalked, preying upon first the native people and then the Scots-Irish settlers that came after them. And today, on the city streets, on the lonely country roads, in the swamps and mountain forests of the South, these powerful humans, spirits and creatures still seek to settle old scores, satisfy their various hungers or find redemption for their sins. The South is haunted by its past, in more ways than one. A complete game: no other products needed to play. Flexible, yet realistic, character creation system. Play as the ageless, people who have seen decades or centuries of Southern history. A complete and accurate guide to the supernatural beliefs of the South. A detailed description of Southern history and geography. Rules for Flashback Play allow for adventuring in any era of Southern history. 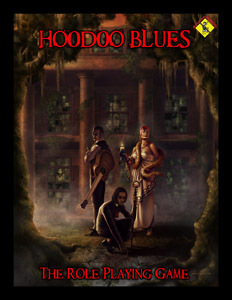 For more information on the game, see Hoodoo Blues In Brief (Also in Hebrew and Swedish ). Have the book? Go here to get a free pdf copy. They come from every walk of life. There are humble Christian monks, passionate artists, logical scientists, intense shamans and more. Some studied various philosophies and mystical systems for years before embarking on the path, others just woke up one morning and decided to make a change. They are young and old, rich and poor. Some are powerful and influential. Some are fugitives, on the run from the law. What they all have in common is that each has decided to throw himself or herself headfirst into the search for wisdom, self-improvement and power. Each has decided that, rather than pursuing one specific dogma, they will travel the world learning from every person and every experience, in essence letting the universe teach them what it will. Each has developed powerful abilities and each has discovered that the world is a much more complicated, much more dangerous and much more wonderful place than they had ever imagined. A complete role playing game. No other products needed to play. Uses ORC-L, the lite version of Organic Rule Components, designed for quick character creation and light or live action play. Play PCs from any background, tradition or philosophical viewpoint. Each character approaches enlightenment, self-improvement or wisdom in their own unique way, and each gains unique abilities from it. Contains “Weaponized Honeybees,” a complete introductory adventure. 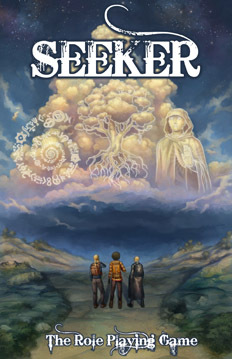 Although Seekers’ adventures may take them anywhere, extensive information is given on small-town America and the secrets and dangers one may find there. For more information on the game, see Seeker In Brief. If you look down the wrong alley in the middle of the night, you may see something happening which is terrible, inexplicable, alien. If you are like most, you will keep driving and try to forget what you’ve seen. Yet some pain or hunger inside you may drive you to turn back, to try to gain another glimpse. You may spend sleepless nights peering down dark alleys, reading heretical texts, performing strange rituals, exploring abandoned places, trying to grasp the sensations that squirm at the back of your mind. Along the way you will discover that you are developing incredible and dangerous powers. A complete game – no other products needed to play. Play ‘the Touched,’ people who have peeked behind the curtain of this reality, people who have incredible powers but are in terrible danger. A unique, fully detailed horror cosmology. A detailed look at supernatural and mundane Los Angeles as a default campaign setting. Fan Rewards: Get free stuff just for playing. Printed Book: International Orders: $19.95 +$15 S&H. – Fulfillment by Vajra SPECIAL NOTE: From 10/11/16 to 10/11/16, orders fulfilled by Vajra may be delayed up to 10 days before shipping. Printed Book: US Orders: $19.95 +free shipping – Fulfillment by Vajra SPECIAL NOTE: From 10/11/16 to 10/11/16, orders fulfilled by Vajra may be delayed up to 10 days before shipping. PDF: $10 -Fulfillment by DriveThruRPG. You have reached the page for the first edition of This is a Dark Ride. This book has been replaced with This is a Dark Ride Second Edition and is no longer available. Anyone who buys the printed book can download the pdf for free here.